Peter von der Ah? is a software engineer in the Core Libraries and Tools group at Sun Microsystems, Inc. His main responsibility is the Java Language Compiler (javac) but occasionally contributes to the core libraries (java.lang and java.util). 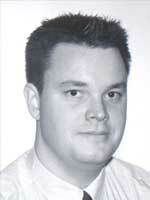 Peter started working with Sun after graduating from the University of Aarhus with a Master's Degree in Computer Science. During his studies, Peter worked for the university and various Aarhus-based software companies, including OOVM A/S, Mj?lner Informatics A/S, and CRYPTOMAThIC A/S. A year before graduating, Peter joined Mads Torgersen's team developing the new wildcards feature, now part of JDK 5.0. Since May 2004, Peter has been living in Mountain View, CA USA.